Gain complete visibility into activity in your Linux environment. 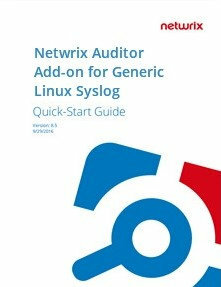 Simply integrate your Linux-based systems with Netwrix Auditor via the RESTful API with this free add-on. Enhance your control over what’s happening across your entire Linux-based environment with a single-pane view of Linux system logs, including detailed information on events, such as failed attempts to start an SSH session or run an SU command. Stay alert to behavior patterns you consider risky, such as multiple authentication failures, to enable quick and efficient response. Investigate these incidents further with the Google-like interactive search so you can safeguard your critical assets in the future. Store your syslog records for years in the two-tiered storage and ensure easy access to this information in case you need to investigate a security incident or pass an audit check. Review detailed instructions for installing the Add-on for Generic Linux Syslog. Start getting insights about what’s happening across your Linux-based systems through Netwrix Auditor intelligence.